Sherree has been designing, decorating, and remodeling homes since 1995. With experience from the mountains of Colorado to farm houses in the South, and from urban historic bungalows to modern suburban dream homes, Sherree specializes in functional designs that support a beautiful yet well-organized lifestyle. She likes to mix staple pieces with vintage or one-of-a-kind accessories to create a space that is completely unique and perfectly you. 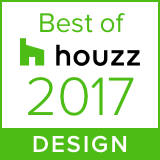 Sherree's designs earned a Best of Houzz award in 2017.